« Vegan Casseroles Cookbook Review and Giveaway, Plus Creamy Spinach Florentine, Almost Alfredo Sauce and Bumbleberry Cobbler Recipes! And here we are, entering the time of the year after the Superbowl. Personally, I don’t even care much about football, but living in Seattle area it was hard not to get under the influence of thousands of people rooting for the Seahawks. Oh well, they didn’t win this time, but losing gives us plenty of opportunity to learn a few lessons and come out wiser from the experience. Today I’d like to share a simple recipe I recently came up with while looking around for ideas of what to make for a casual Sunday lunch. Wraps often come in handy because I can wrap just about anything in a tortilla, and the wrap will taste just fine. I was trying to do something different this time, and here’s how the Barbecue Portobello Wrap was born. The beauty of this wrap is that it requires only a handful of ingredients, comes together quickly, and has all the flavors and textures you get from a meal at a barbecue party. 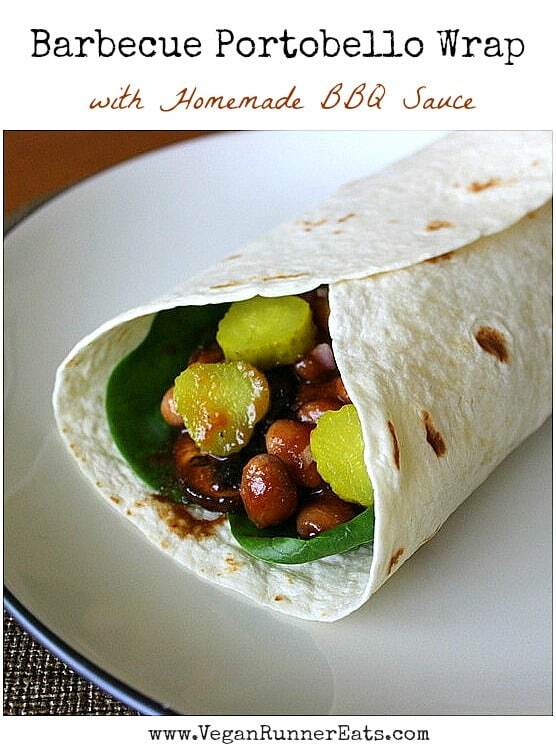 My homemade Easy BBQ Sauce from this recipe is used in two ways – it covers Portobello mushroom slices that act like a slightly chewy ingredient, and is added to pinto beans that deliver plenty of protein and fiber. I buy large flour tortillas at local grocery stores, but if you want to go all fancy, you can use healthier whole-grain or whole-wheat tortillas. If you avoid gluten, look for gluten-free tortillas and tamari sauce, plus check the ingredient labels of the BBQ sauce components. This delicious wrap comes together in minutes, yet it has all the flavors and textures of a slow-cooked barbecue meal. It’s easy to make this wrap gluten-free by using tamari in place of soy sauce, and a gluten-free wrap instead of the wheat flour variety. Prepare your BBQ Sauce, or measure out 1 cup of store-bought barbecue sauce. Heat 1-2 Tbsp of water or low sodium veggie broth in a large nonstick pan over medium heat. Once the liquid is bubbling, arrange sliced Portobello mushroom pieces in the pan, preferably in one layer. Do this in batches if you can’t fit them all at once. Cook Portobello slices on medium heat for about 5 minutes, flipping them halfway, until they soften. Drizzle the slices with low sodium soy sauce, sprinkle with some black pepper, and take the pan off the heat. Put the softened Portobello slices into a medium bowl, add ½ of the BBQ sauce, and stir until well coated. Warm up the pinto beans in the microwave for 1 minute, add the rest of the BBQ sauce and stir to combine. 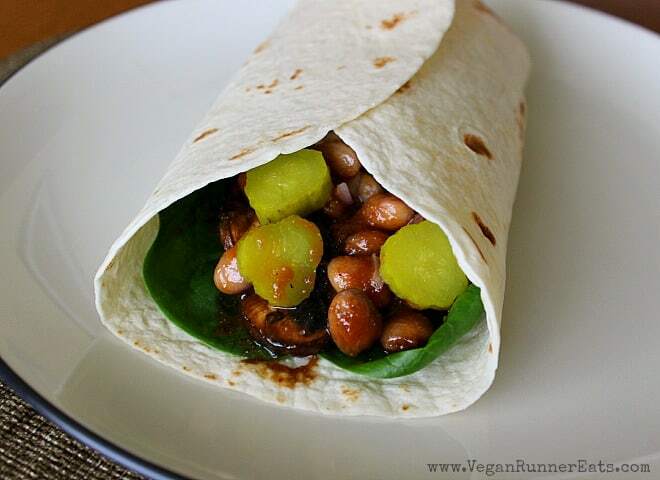 To make one wrap, arrange half of all of the ingredients in layers on a large tortilla**: spinach leaves, mushrooms, beans, sliced pickles, chopped onions. Fold the bottom of the tortilla up and over the filling, and then fold the sides to make your wrap. If you don’t intend on eating the wrap right away, you can keep the sides of the tortilla from unfolding by piercing the assembled wrap with a toothpick. Repeat with the second wrap. Enjoy! *Other types of cooked beans can be used – kidney, cannellini, chickpeas, etc. **Tortillas can be warmed up by being microwaved for 15-20 seconds, or placed on a hot dry skillet for 30 seconds. Question for you: What’s your favorite vegan lunch? Please share in the comments after the post! This recipe was featured in Virtual Vegan Linky Potluck #6 over here. The winner of the Vegan Casseroles cookbook giveaway is April G.! Congratulations April, be on a lookout for an email from me! Tagged BBQ, mushrooms, pinto beans, spinach, vegan lunch. Bookmark the permalink.